The actual facts can at times present an obstacle in the dramatization of a historical event. Novelist Thomas Kennealy and director Steven Spielberg didn’t know what exactly transpired in the concentration camp where Oskar Schindler eventually saved over 1,000 Jews from extermination, so they invented certain specific events for dramatic effect. The result was Schindler’s List, an excellent novel that became probably the best movie ever made about the Holocaust. Garrard Conley, a survivor of a less deadly but still emotionally and psychologically damaging camp of sorts, wrote a memoir that related his experiences as a young man who was “treated” in a gay conversion center. While the resulting movie of Conley’s experiences, Boy Erased, is compelling at times, ironically, it isn’t as good as a recent entirely fictional dramatization of the same subject matter, The Miseducation of Cameron Post. In real life, Conley (called Jared Eamons and portrayed by Lucas Hedges in Boy Erased) was a conflicted 19-year-old who was outed to his parents as gay by a vindictive ex-boyfriend. Faced with a choice between being disowned and enrolling in a gay conversion therapy “treatment program,” he chose the latter and spent several months there before leaving and becoming an activist against the so-called treatment, which is still legal in 36 states. His memoir of his experiences became the basis of Boy Erased. The movie actually begins with Jared entering the Love in Action conversion center for “treatment.” Over the course of the film, the script by Joel Edgerton (who also directed the film and co-stars as the center’s chief counselor, Victor Sykes) gradually reveals the events in Jared’s past that led to his entering the center. As it turns out, Jared is quite conflicted about his sexuality. Jared was not interested physically in the girls he dated in high school and, when he entered college, he had two encounters with men. One was a flirtation with a student he met at an art exhibit that did not become physical. The second was with another student, Henry (Joe Alwyn) who raped Jared when he spent the night crashed out in Henry’s room. Henry later panicked, afraid that Jared might report him, and outed Jared to his parents. Jared’s father, Marshall (Russell Crowe), a Baptist minister, gives Jared a polite ultimatum (as shown in the scene below), either go to the center or leave the family. Much of Boy Erased takes place at the center, which operates more like a summer day camp than an in-house facility. Jared and his mother Nancy (Nicole Kidman), who brought him to the center spend their nights at a local motel while she drops him off each day. Jared would attend classes with other young gay men (and one woman) that were intended to “cure” him. The classes were a mixture of being taught how to act manly (firm grip when shaking hands), along with some bizarre attempts at psychoanalysis in which the students diagrammed their family trees, listing the problems such as drug addiction, alcoholism, and compulsive gambling that various members had (supposedly, Jared’s gayness resulted from these bad influences). Describing the various aspects of Jared’s treatment on the written page (or the computer screen) makes them appear humorous, and, indeed, it’s easy to see how a comic troupe can create a routine from this material. But Boy Erased is a dead serious movie with almost no humor whatsoever, not even dark satire. The events portrayed actually occurred, and Sykes and the other counselors honestly believed that homosexuality was a learned behavior that could be “unlearned” through the right form of therapy. Surprisingly, except for one scene in which Jared’s fellow “patients” beat a young man repeatedly with Bibles, there is almost no physical violence or the type of shocking mistreatment audiences might expect. In a movie like this. Instead, Jared’s therapy is, in some ways, worse than actual physical abuse. He is humiliated by the role-playing games, including one in which the patients were required to write down their actual gay behavior and read it aloud. When Jared truthfully describes his somewhat limited experimentation, Sykes keeps pressuring him to confess to having engaged in more graphic activity. It soon becomes evident to everyone that the purpose of this exercise is actually to get Sykes excited (the real person that the Sykes character is based on came out several years after the events portrayed in this film, which took place in 2004). I can understand Joel Edgerton’s reasoning in not wanting to turn Boy Erased into lurid melodrama. But, by the time the movie ended, I had a feeling that Edgerton had sanitized and streamlined the script somewhat, making it appear that Jared’s treatment, although definitely not helpful, was more a few random incidents rather than the intense attempts at indoctrination that really occurred. Also, by keeping the focus exclusively on Jared, the audience is deprived for the most part of seeing how the treatment really affected the other patients and their families. By the time the film ended, I had got the distinct impression that I had somehow not seen the entire story about what went on in the center. Fortunately, Edgerton does show how Jared’s treatment affected him and his mother, both of whom are transformed duri the film. When she took Jared to the center, Nancy was a prototypical Southern housewife, polite and highly submissive toward her husband. But as she sees what happens to Jared, she becomes more assertive and makes sure that he is able to leave and return home finally. But her transformation isn’t as stark as that of her son. Ironically, by the time he leaves the center, Jared’s original confusion about his sexuality is replaced by the firm knowledge that he is gay, and he manages to adjust well in the following years. The film adds a somewhat lengthy epilogue showing what happened to Jared several years after his visit to the center. In some ways, this segment resembles a tacked-on happy ending featuring a reconciliation scene of sorts between Jared and his father. Presumably, this actually occurred, but the way Edgerton handles the material is a bit mushy. The topic of gay conversion centers is still a controversial one, and they remain legal in most states, including Arkansas (where Jared’s story took place). With two movies out over a six-month period dramatizing the emotional and sometimes physical pain that these centers cause, Garrard Conley’s personal quest to close them down may be closer to reality. 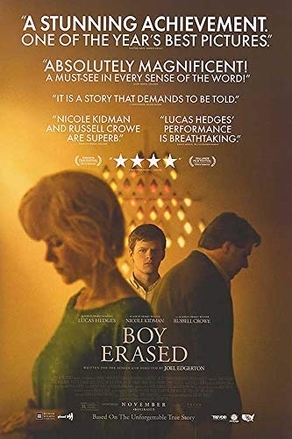 Boy Erased, with its top-notch cast in fine form, unquestionably makes a powerful statement in that regard, but, ironically, it may have been just a bit too restrained for maximum effectiveness. In this clip, Russell Crowe asks Lucas Hedges if he wants to "change."